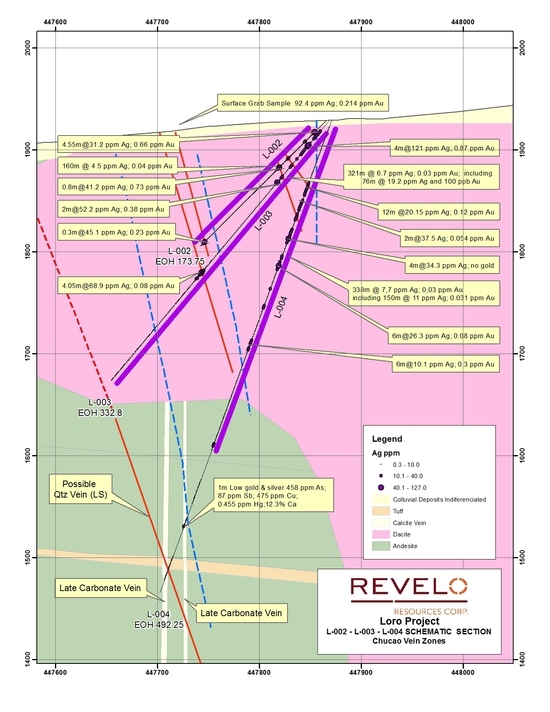 Vancouver, British Columbia--(Newsfile Corp. - August 15, 2018) - Revelo Resources Corp. (TSXV: RVL) ('Revelo' or the 'Company') is pleased to provide an update to the drill program at its Loro precious metals property that it is operating on behalf of its joint venture partner, a subsidiary of Hochschild Mining PLC ('Hochschild'). 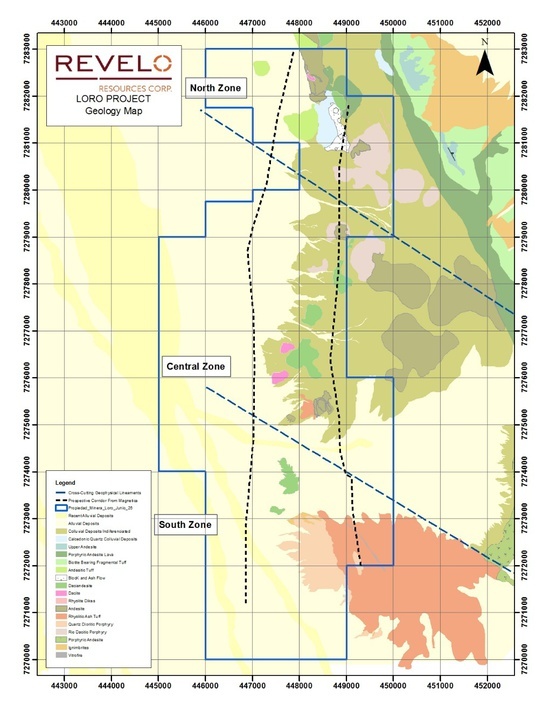 The first pass drill test, previously announced (see news release dated May 2, 2018), was completed in July with a total 2,972 metres drilled in 10 holes, and has confirmed the presence of a potentially large, low-sulphidation epithermal vein system with significant broad, low-tenor silver-gold intercepts such as 76m @ 19.2g/t Ag + 0.1g/t Au (L-003), enveloping higher-grade intercepts related to a series of narrow vein structures such as 0.5m @ 179g/t Ag + 0.51g/t Au (L-005). Drilling to date has tested one small portion of the large 4,800-hectare property. The drilling was focused on two vein trends, Chucao and Tricao-Caleu, located on the Cerros Millahue and Pitekun respectively, in the 'Central Zone' of the property encompassed within an area of approximately 800m (N-S) by 500m (E-W). Silver-rich quartz +/- carbonate veins, veinlets and associated hydrothermal breccias encountered by the drilling along the Chucao structure could represent the hanging-wall expressions of a major vein lying under cover on the western edge of the Cerro Millahue dacitic dome complex, the exploration for which requires further drill testing. Two massive late carbonate veins towards the bottom of L-004 contain breccia fragments of epithermal quartz vein material suggesting that such a possibly mineralised quartz vein occurs in the vicinity. Silver-rich halos in the hanging-walls to mineralised structures are typical at El Peñon, the major gold-silver mining district located 25 Km to the north. The Cerro Millahue and Cerro Pitekun area is characterised by a rhyo-dacitic dome complex identified by geological mapping of sparse outcrops together with geophysical information (see news release dated March 14, 2018.) The Chucao and Tricao-Caleu vein systems were identified and mapped from sparse outcrops and sub-crops of veins and were consequently targeted for this initial drill test. 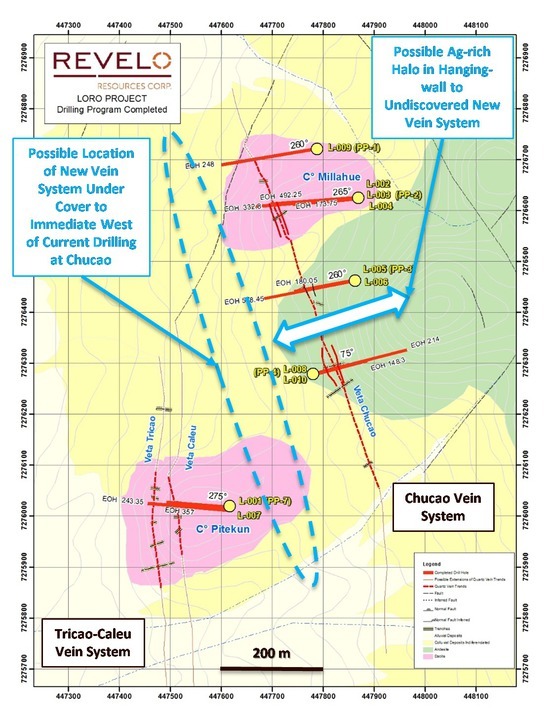 Four drill-hole fences (8 holes) were drilled over approximately 400m of strike length of the Chucao vein system, and one drill fence (2 holes) was drilled on the Tricao-Caleu system (see attached maps and sections). Mineralised intervals are hosted within the rhyo-dacitic dome complex, together with lesser andesitic volcanics, tuffaceous and volcaniclastic rocks. The host rocks and many of the mineralised structures are affected by a late carbonate overprint that may have diluted metal grades in some areas. Broad zones of low-grade silver and gold together with multiple, narrow higher-grade structures were cut by the drilling. The following table indicates some of the best results. Please also refer to the attached maps and section for further details. Assay results for holes L-008 and L-010 (Chucao), and most of L-007 (Tricao-Caleu) are still pending. Note: All quoted widths are down-hole widths, and do not necessarily represent true widths. The vein structures cut to date along the Chucao and Tricao-Caleu vein zones all display hydrothermal breccias and quartz +/- carbonate veining of low-sulphidation epithermal type, with multiple silicification events and classical textures for low sulfidation epithermal deposits including, in part, banded, crustiform-colloform, massive, brecciated and lattice textures. Amethystine quartz occurs in some of the breccias and veins. Ore minerals in the veins identified to date include acanthite, pyrargyrite / proustite, and possible electrum, with associated minor base metal sulfides. Some banded quartz veins, particularly in the deeper (> 250m) portions of the Chucao vein system seen in hole L-004, are crosscut by late, barren calcite veins and veinlets, likely precipitated from steam-heated fluids. These massive and barren calcite veins have overprinted and diluted likely pre-existing hydrothermal breccias and veins. This is evident by the presence of quartz-vein breccia fragments within the late carbonate veins and carbonate cemented breccias encountered at depth in hole L-004. These breccia fragments may reflect a pre-existing mineralised quartz vein that could sub-crop in the flats under thick colluvial cover, immediately west of Cerro Millahue, where float blocks of quartz vein material occur. This idea is supported by the possibility that all the silver-rich quartz veins, veinlets and associated hydrothermal breccias encountered during this initial drill test along the Chucao vein system could represent the hanging wall expressions of the proposed new vein system lying under cover on the western edge of the Cerro Millahue dacitic dome complex. This idea requires further follow up and drilling. Elevated arsenic, antimony and mercury values suggest that the very upper portions of the epithermal vein system have been cut, with most of the drilling to date cutting structures at relatively shallow vertical depths of around 100 metres to 200 metres, with a maximum vertical depth of around 400 metres in the case of the western-most Chucao vein structure in hole L004. Current interpretations suggest that, apart from following up the possible covered vein to the west of Cerro Millahue, deeper drilling may be required. Typical ore shoots in such epithermal vein systems may have vertical extents of only 200m to 300m, and lateral extents of 100m to 300m. Magnetics features likely associated with at least three separate, en-echelon arranged, rhyo-dacitic dome complexes, centred on the North, Central and South Zones, which may be genetically and spatially related to the epithermal veins sought. All samples have been sent to ALS Chemex laboratories in Antofagasta, Chile for PREP-31B preparation, and subsequently sent to ALS Chemex laboratories in Lima, Peru for Au-AA24 analysis for gold, and ME-ICP61m analysis for 33 elements including silver. Mercury analyses are also being carried out using the Hg-MS42 (0.005 -100 ppm) package. Quality control measures include the insertion of 10% of standard materials, including blanks, together with 10% of field duplicates and 5% of analytical duplicates. The Loro project is currently subject to an option, sale and royalty agreement with a subsidiary of Hochschild. Under the agreement, Revelo will operate Phases 1 and 2 of the exploration program (to end Year 3). Hochschild can earn a 100% interest in the Loro project over a maximum of five (5) years in exchange for a series of in-ground investments and/or drilling commitments totalling US$13 million and/or 30,000 metres, and a series of cash payments to Revelo totalling US$5.3 million. Further payments totalling US$15 million are due once the option has been exercised by Hochschild. Revelo will be the beneficiary of a 1% NSR royalty on any future production from the property. (See Company's News Releases dated June 6, 2017and September 05, 2017). For further details of the Loro Project please refer to the Loro Project page on Revelo's website (www.reveloresources.com). Revelo has interests in an outstanding portfolio of projects prospective for copper, gold and silver located along proven mineral belts in one of the world's top mining jurisdictions — Chile. The Company has a combination of wholly-owned projects (available for option, JV or sale), option agreements, royalty interests (non-producing to date), and equity interests in mining and exploration companies. Revelo's total exposure to mineral tenements in northern Chile, either wholly-owned or through royalty interests, is around 200,000 hectares. This news release contains certain statements that may be deemed 'forward-looking statements'. All statements in this release, other than statements of historical fact, that address events or developments that Revelo expects to occur, are forward-looking statements. Forward-looking statements are statements that are not historical facts and are generally, but not always, identified by the words 'expects', 'plans', 'anticipates', 'believes', 'intends', 'estimates', 'projects', 'potential', 'indicate' and similar expressions, or that events or conditions 'will', 'would', 'may', 'could' or 'should' occur. Although Revelo believes the expectations expressed in such forward-looking statements are based on reasonable assumptions, such statements are not guarantees of future performance and actual results may differ materially from those in forward-looking statements.